The trend in the cost of diesel fuel is dropping once again. This decline in prices that began last month according to the US Energy Department has become a trend. 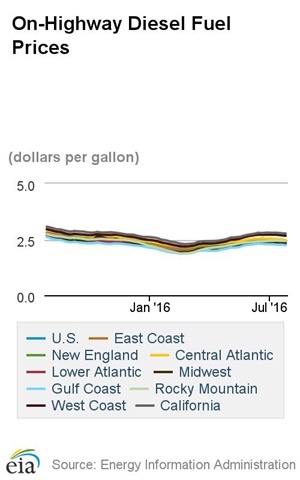 With prices dropping b y 2.3 cents bringing the average price per gallon to $2.379 per gallon across the nation the new price is down by ¢34.4 over the price the same time last year. By region, the largest drop in pricing occurred in the Midwest which dropped ¢2.3. Following a surge in energy prices, crude oil prices seem to be going down too. While this brings mixed emotions, some reveling in the lower operation costs while other reeling from the impact on the overall economy. The trucking industry as a whole is benefitting from lower costs. With the lower cost of fuel some diesel engine users are enjoying even lower costs using Enerburn. Enerburn is a diesel engine catalyst that lowers the temperature of combustion and improves fuel consumption, while increasing performance and lowering emissions. For more information about how Enerburn can be used to further lower your operational costs take a look at some of the proven results. EnerBurn Catalyst is the most effective solution for particulate regeneration to improve the performance and maintenance of your DPF systems.